Dreesen E et al. (2017). Practical recommendations for the use of therapeutic drug monitoring of biopharmaceuticals in inflammatory diseases. Clinical Pharmacol 9, 101-111. J Kang and M Lee (2009). Overview of Therapeutic Drug Monitoring. Korean J Intern Med 24, 1-10. Moots RJ et al. (2017). The impact of anti-drug antibodies on drug concentrations and clinical outcomes in rheumatoid arthritis patients treated with adalimumab, etanercept, or infliximab: Results from a multinational, real-world clinical practice, non-interventional study. PLoS One 12, e0175207. Krishner M and Nadler SG (2016). Immunogenicity to Biotherapeutics – The Role of Anti-drug Immune Complexes. Front Immunol 7,21. Raine T (2014). 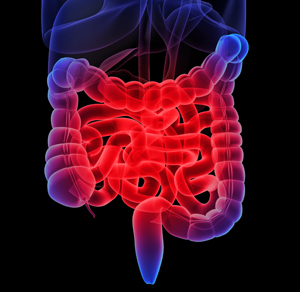 Vedolizumab for inflammatory bowel disease: Changing the game, or more of the same? United European Gastroenterol J 2, 333–344. Wyatt T et al. (2016). An Overview of the Mechanism of Action of the Monoclonal Antibody Vedolizumab. J Crohns Colitis 12, 1437-1444. Suffering from a chronic condition can mean constant treatment for a number of months, years, or even a lifetime. It is therefore important to find a treatment regime that keeps patients’ symptoms under control, while limiting adverse side-effects. It might seem like there is a simple solution: work out a standard dose and prescribe that dose to each patient. However, as each patient is individual, different factors will affect how a drug works for them. These include weight, metabolic rate and how diligently they adhere to the treatment regime; these factors can fluctuate throughout a patient’s lifetime. In addition events such as stress, illness, pregnancy and other medication also influence the effectiveness of treatment. To ensure that the treatment continues to be beneficial and account for these changes, it is important that the actual concentration of drug in the patient’s body is known. 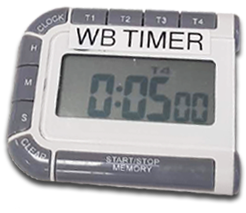 Therapeutic drug monitoring enables physicians to measure the precise concentration of drug for an individual patient, so that if necessary the prescribed dosage or treatment regime can be adjusted to ensure a safe and effective concentration of the drug is maintained in a patient’s bloodstream (Kang and Lee 2009). Therapeutic drug monitoring is beneficial when a drug has a narrow therapeutic range, wide pharmacokinetic (PK) variability, or has adverse effects that should ideally be avoided. 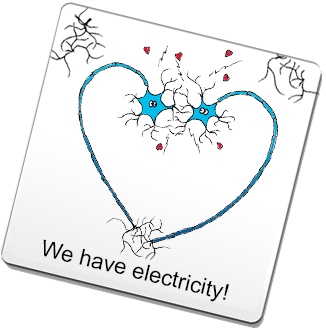 For some conditions, for example schizophrenia, the treatment (lithium) only has a narrow window between therapeutic effects and toxicity. To optimize treatment for each individual patient, ensuring it is safe and effective, the efficacy of the drug is assessed by measuring the concentration of the drug in the blood or sera. Biologics, such as monoclonal antibodies, are one type of drug that can benefit from therapeutic drug monitoring to ensure they continue working for a patient. Immunoassays are sensitive and precise enough to be able to accurately monitor the drug concentration, and capture and detection reagents can be designed that only bind to the drug and not to other similar antibodies. 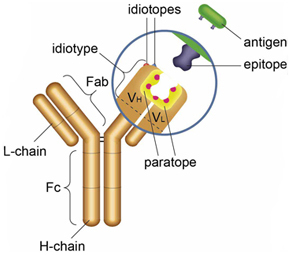 Such anti-idiotypic antibodies specifically bind to the idiotope of another antibody (the variable part of the antibody containing the antigen binding site, Figure 1). 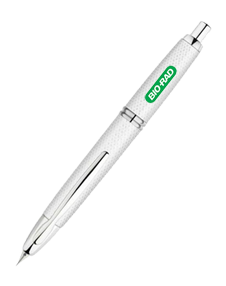 They can be paratope-specific and therefore inhibit the binding of the antibody drug to its target. These anti-idiotypic antibodies are therefore ideal to use for PK bridging or antigen capture assays to monitor drug levels. Fig. 1. Anti-idiotypic antibodies bind to the idiotope of another antibody. An example where therapeutic drug monitoring is used to ensure effective treatment is inflammatory bowel disease (IBD) (Dreesen et al. 2017). Crohn’s disease and ulcerative colitis are caused by an overactive immune response resulting in inflammation in the gastrointestinal tract. Painful ulcers can develop as well as diarrhoea, fatigue, cramping and weight loss. In addition to steroids and immunosuppressants, a variety of biologic monoclonal antibody drugs have been licensed to treat IBD including: infliximab, adalimumab,& vedolizumab and etanercept. Currently, the two most common biologic drugs used to treat IBD are infliximab and adalimumab, along with etanercept they work by targeting TNF alpha (albeit in different ways), the cause of the excessive inflammation producing symptoms. The continuous exposure to these monoclonal antibody drugs can result in the patient’s immune system developing antibodies against the medication, which impacts the drug’s effectiveness and can cause unwanted immunogenicity (Krishner and Nadler 2016, Moots et al. 2017). Detecting anti-drug antibodies in a patient can help inform physicians about the patient’s immune response and effectiveness of the treatment. As a result, therapeutic drug monitoring can then be used to optimize treatment for a patient and keep their symptoms in remission. Infliximab and adalimumab, although commonly prescribed, often induce anti-drug antibodies which impair the effectiveness of treatment, or become poorly tolerated by the patient. A newer biologic drug used to treat IBD, vedolizumab, has a different mechanism of action and may be prescribed when a patient hasn’t responded well to treatment with anti-TNF alpha antibodies, like infliximab (Raine 2014). Vedolizumab works by targeting a gut selective integrin (α4β7) and stopping the excessive movement of leukocytes to the gut (Figure 2), thereby reducing the inflammation in the gut (Wyatt et al. 2016). As its site of action is restricted to the gut, vedolizumab is less likely than infliximab, adalimumab and etanercept, to cause side-effects. It also appears to be better tolerated as it only reduces gut inflammation rather than globally targeting the immune system, reducing inflammation generally. Although there appear to be fewer reported side-effects with vedolizumab, therapeutic drug monitoring is still required to determine the optimal dose for each patient in order to keep IBD in remission. Fig. 2. 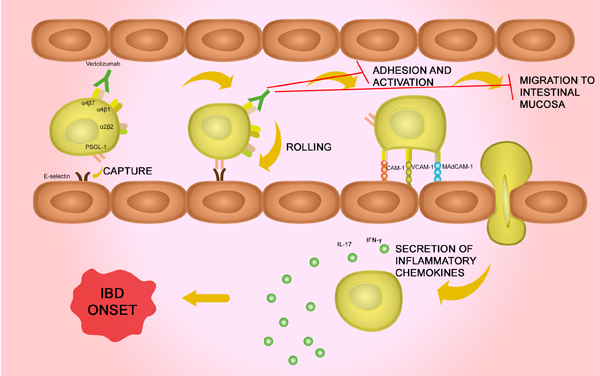 Vedolizumab mechanism. Vedolizumab works by binding to α4β7 therefore preventing binding to its receptor. This inhibits the adhesion and activation, and the migration of the T cells to the intestinal mucosa. If vedolizumab isn't present, these T cells secrete inflammatory chemokines and cause the inflammation that triggers the onset of IBD. Fig. 3. Vedolizumab PK bridging ELISA A, schematic image of PK bridging ELISA. An anti-vedolizumab antibody in monovalent Fab format (purple) is immobilized at low density and captures the vedolizumab in the serum sample. The bound drug (gold) is then quantified with a second, labeled anti-idiotypic antibody (blue) that binds to the free idiotope of the drug. B, vedolizumab PK ELISA bridging format using antibodies HCA292 and HCA294P. We have four new inhibitory anti-idiotypic antibodies targeting vedolizumab (Entyvio). These new recombinant monoclonal antibodies inhibit the binding of vedolizumab to its target, α4β7 integrin, and therefore detect free drug. A pair of these antibodies is ideal for developing a PK bridging ELISA (Figure 3).